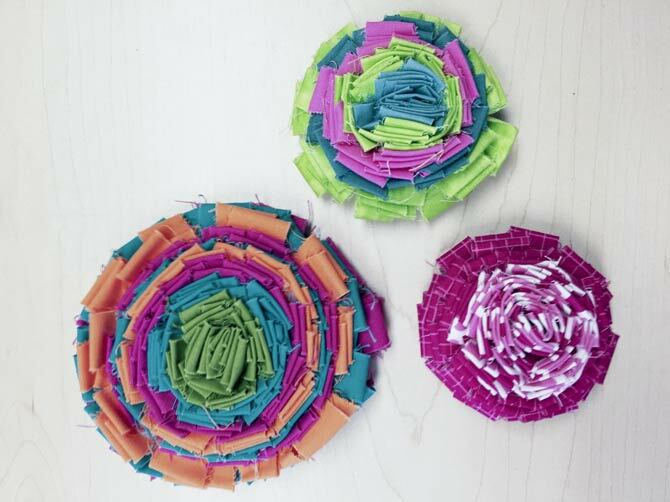 Fabric flowers made from strips of fabric. Yesterday we looked at 2 ways to make flowers out of fabric squares to add dimension your quilts. Another fun and easy way to make fabric flowers is to use fabric strips to create fantastic 3D flowers. 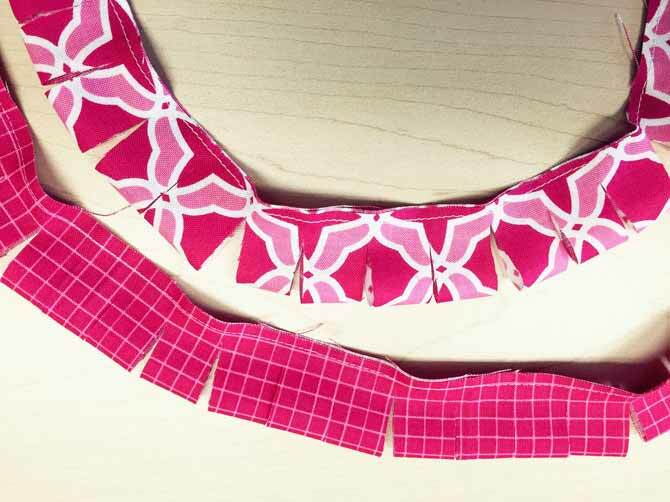 Here are 2 ways to transform fabric strips into superb flowers for quilts! 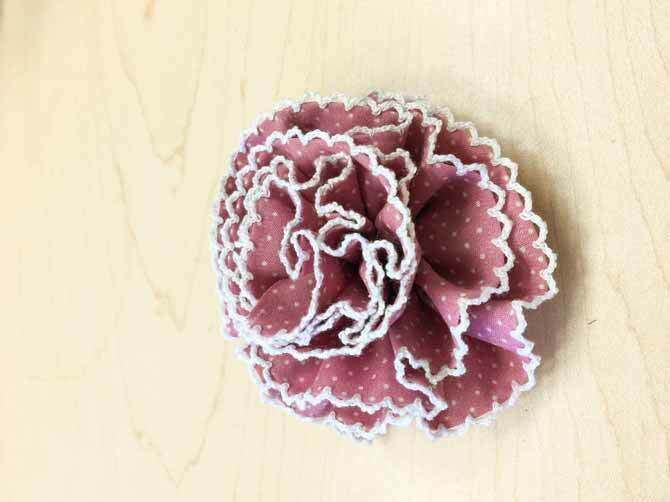 To create this scrap ‘n’ slash flower, you’ll need 3-4 strips of fabric 20” x 2 1/2”. Depending on how big you want your flower will depend on how many strips you cut. 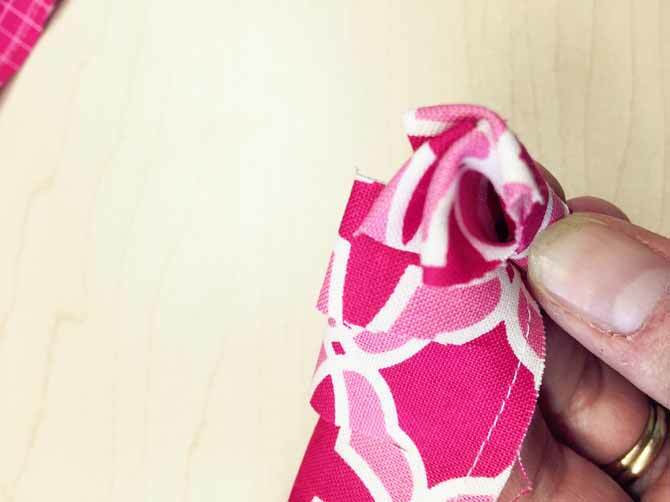 Fold the strip in half wrong sides together and stitch along the long raw edge about ¼” in from edge. Do one at a time. Do not press. Stitch along horizontal raw edges. Cut every 1/2″ along the fold length but not all the way through. Stop slightly before the stitched line. Cut along fold every 1/2″ but not all the way through, just close to stitch line. Start at one end of one strip, roll it up a little, then put a hand stitch in catching the raw edges along the bottom. Continue rolling and making little stitches to hold it together along the bottom. When one strip is completely rolled up, add another strip on while making stitches along the bottom and rolling the strip. Upon completion, stitch the end of the strip to the flower and either stitch or glue a round felted pad to the bottom end to hold the flower in place. Roll up the strip tightly and make stitches every half a roll along the bottom to hold in place. Attach to a quilt with Velcro so you can remove when washing or stitch through the flower and quilt for a more permanent look. This flower is a great embellishment to a quilted bag. 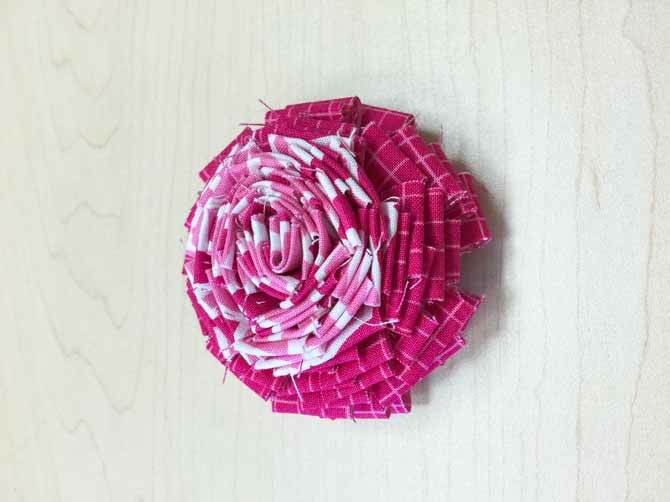 Fabric flower created by using strips of fabric. 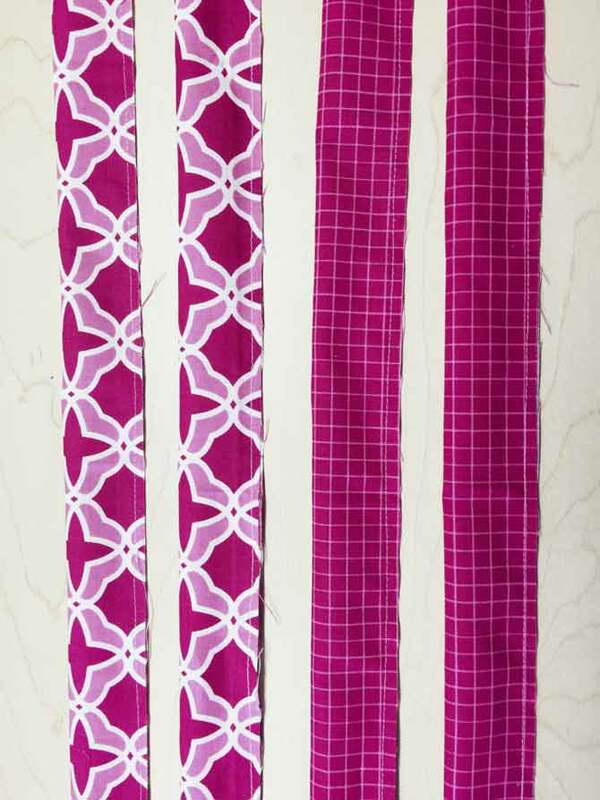 Now try making some using different widths of fabric, 3″ and 2 1/2″ and solid and print fabrics! You can tuck these little flowers anywhere! 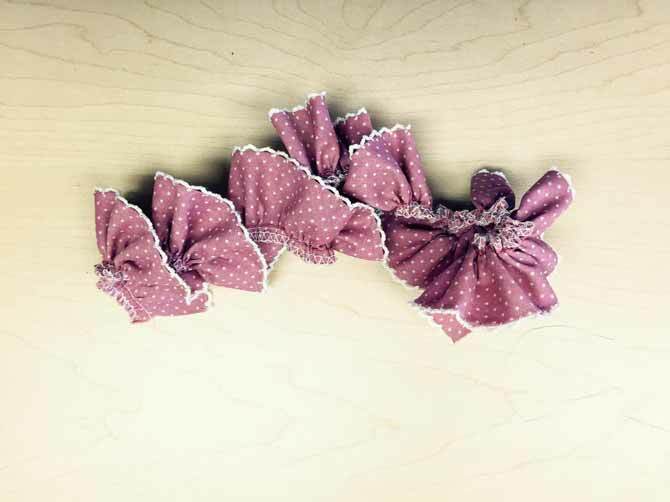 This next flower is great made up with fabric or ribbon. Cut a strip or use a ribbon approximately 2″ wide (width doesn’t really matter) x 30″ the length will determine how full the flower is. Make a gathering stitch along one raw edge or horizontal edge, a scant ¼” from the edge. Pull the threads until the strip is approximately half the original length. Gather the strip up to approximately half it’s original length. Starting at one end, roll along the length, hand stitching to secure as you go. Continue rolling and stitching along the bottom until you reach the end. Attach by hand stitching or gluing onto a round felt pad. 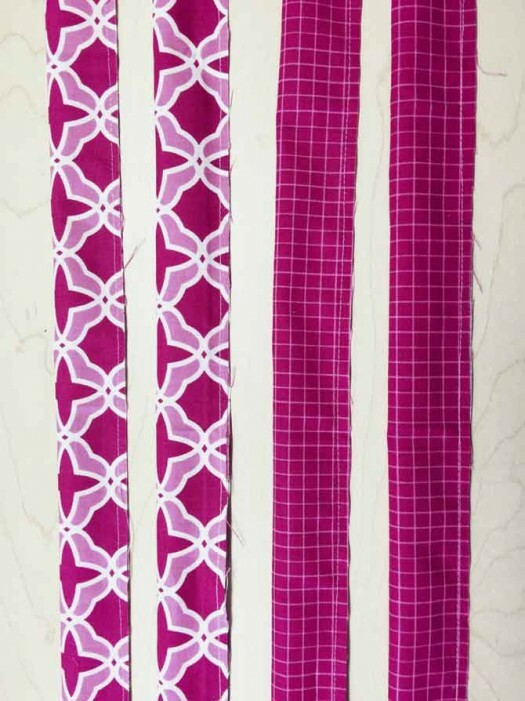 Your beautiful strip flower is ready to be attached to a quilt, headband, quilted bag or as a wristlet. The sky is the limit! Fabric strip flower made from ribbon. These are 2 ways to transform fabric strips into superb flowers for quilts when you want to add embellishment, dimension or texture to your quilt. It’s easy and fun. What fun! This is a delightful (and useful!) way to use fabric scraps. I can just imagine the beautiful wallhangings.